God's Bait and Pawn: Jack is Gone!"? "Spirit Driven Events - God's Bait and Pawn: Jack is Gone!" is the sequel to "Spirit Driven Events - "Jack is Back!" 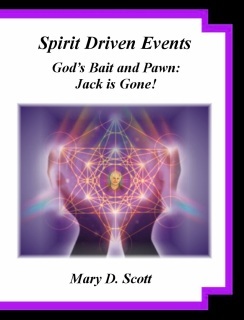 Spirit Driven Events - God's Bait and Pawn: Jack is Gone! This is the sequel to Spirit Driven Events - Jack is Back! A very insightful book with a surprise ending for all concerned in a spiritual-gracious well thought out sequence of events. This is a well researched and documented work on the subject of Jack the Ripper (both original Jack and reincarnated Jack). Mary devoted seven years of her life to Jack and his spirit which took a tremendous toll on her psyche and energy. In this book she shares all of this with the reader. It definitely is a page-turner. Mary Scott sums it up best in her own words "Hold onto your hats--for you are in for a very bizarre and wild ride!" But it has a surprising happy ending and who doesn't like happy endings? Mary Scott has had to deal with the heavy burden of "Jack" far too long. I am glad to see he is GONE! She has written a descriptive account of her ordeal, with Jack, over the years in her book, "God's Bait and Pawn." People interested in the paranormal will find this book interesting. I'm so glad I was a part of this Spirit Driven Event. Thank you God for seeing Mary and Roger through this ordeal. Jack was one mean dude past and present. Thank you lord for getting rid of him. If you are looking for a true paranormal book to read? This is a book for you! ﻿I just finished rereading this excellent novella…. Who doesn’t like “happy endings”? How do we really know when we have experienced one? We all want to believe that stories end happily…. but do they really? It is Halloween Eve, 2014…. I feel shivers running down my spine. Anxiety is gripping my body. My blood seems to be rushing endlessly as my heart and pulse race. Is Jack really gone? I fear not. Will he strike again, perhaps tonight? I fear he might? Oh, where can I hide, out of his sight. This is a fascinating follow up on how the reincarnation of "Jack the Ripper" will never take place, now that evil has been put in its place... The cycle has been broken ...7 years of research well spent! I found the book to be an extremely well written work of non-fiction. I found it mesmerizing in the details and it holds one’s interest to the very end. I couldn’t put it down until the last word was read.